Vero has always been a little odd. He’s a smart kid who sees the world a little differently than his friends and family, and not just because he’s adopted. For example, Vero has an almost overwhelming desire to fly. Not in a plane, you understand; he wants to just fly. That particular desire has always been something of a problem, but it makes perfect sense when young Vero turns twelve and learns he’s actually not a regular kid after all. He’s a fledgling guardian angel—and a “special” one at that. 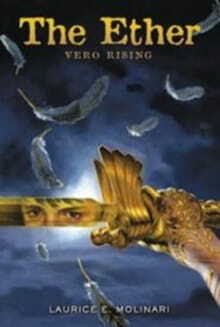 Before you can say “Harry Potter” Vero is whisked off to angel school in a place called “the ether.” It’s a spiritual realm between heaven and earth where angels (and their fallen counterparts) dwell. Here Vero and his classmates will learn to (literally) spread their wings, follow God’s leading, answer prayers, and fight the enemy. In a stealthy reminder that we clueless humans may be surrounded by angels, Vero’s counterparts are a varied group that includes a tough girl from the foster care system, a wheelchair-bound boy, and a kid with severe autism. At least, that’s how they appear on earth; only in the Ether are their true selves revealed. Time on Earth conveniently stands still while Vero’s in the Ether, so he can pop back and forth between worlds as needed. As if being twelve isn’t difficult enough, what with bullies and track meets and girls and all, Vero now has to deal with all sorts of evil creatures that are out to kill him. Fortunately angels, like humans, are never alone. On the one hand, this is an entertaining, highly readable story with some nice lessons to impart. There’s plenty of teenage angst combined with just enough gross parts to appeal to the boys without putting off the girls. The story zips along from one exciting adventure to another, tackling bullies, selfishness, family issues, and more. On the other hand, there are some aspects Christian readers—especially those of an evangelical bent—may find mildly troubling. While God gets a fair number of mentions, Jesus is conspicuously absent. Much of the angel lore comes not from the Bible but from ancient Jewish tradition. The young angels-in-training are taught to listen to God’s leading in their hearts but there’s no mention of studying the Bible for any guidance it may have to offer. All a bit nit-picky, perhaps, but all told The Ether felt a bit more like a ‘spiritual’ young adult novel than a ‘Christian’ one. Maybe the next volume in the series will clear that up. The author’s previous work is as a successful Hollywood screenwriter, which explains the choppy ‘cut to commercial here’ feel of early chapters. It also explains her fine grasp of dramatic situations and gift for making settings and characters come alive. The only real exception is Vero’s (human) friend Tack; he’s a little too much of stereotypical fat kid. With so many nuances present in other characters, Tack’s shallowness seems out of place. Maybe he’ll get more depth next time around. Meanwhile, both kids and adults will enjoy a visit to The Ether.